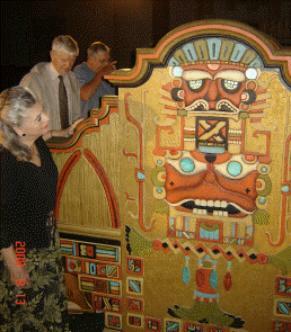 The group gathers around the four manual Wurlitzer console on stage at the Senate Theater. 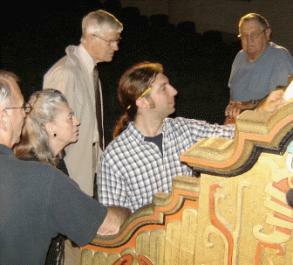 George Orbits, far left, recounts the history of the saving of the organ, formerly in the Fisher Theater, Detroit. 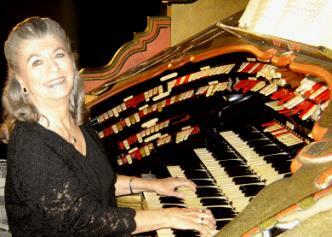 MaryAnn Balduf admires the organ console inlay, which complemented the original Fisher Theater decor . Jim wilkes, Jerell Frederick and Dana Hull discuss the organ’s unique combination action..
Steven Ball checks his registration before a turn at the organ..
Stephen Warner commands Let there be organ pipes, and he saw that it was good. 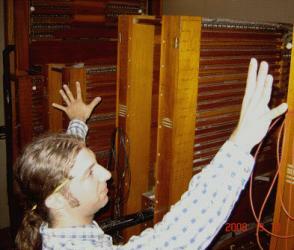 Reuben Seward watches the Power Point presentation about the organ. 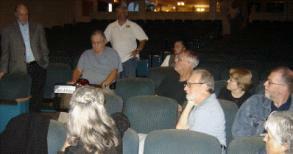 Chapter President Carl Balduf called the September 13, 2008 meeting of the Michigan Chapter of the Organ Historical Society to order at 9:40 a.m. at the Senate Theater in Detroit, Michigan. Present were Henry Aldridge, Carl Balduf, MaryAnn Balduf, Steven Ball, Trevor Dodd, Jerell Frederick, Diane Hiltner, Ken Holden, Dana Hull, John Keeber, Edward Seward, Emily Seward, Rueben Seward, Stephen Warner and Brian Sweetman. Hosts fr the day were Chris Dengate, President of the Detroit Theater Organ Society and George Orbits Society founding member. The meeting began with Balduf's request for approval of the minutes of May 31, 2008 meeting as posted on the Web site and provided in printed form at the meeting, including a minor spelling change which Balduf pointed out. Approval was moved and seconded. The motion carried. Balduf then pointed out the Treasurer's Report, printed as part of the agenda because of the absence of Treasurer Terry Jankowski. The report is available below. It was moved and seconded that the chapter contribute the sum of $50 to the Detroit Theater Organ Society for their hospitality and the refreshments that were graciously provided. The motion carried unanimously. Balduf then announced that the next Chapter meeting will be held on Saturday, October 18, 9:30 a.m. at Angelica Lutheran Church in Allen Park, Michigan, hosted by David Hufford, organist and co-owner of the Renaissance Organ Company of Ann Arbor. There being no further new business the meeting was adjourned at 9:55 a.m.
Balduf then introduced Stephen Warner, who introduced the mighty 4/34 Wurlitzer Theater Pipe Organ Opus 1953 (1928). 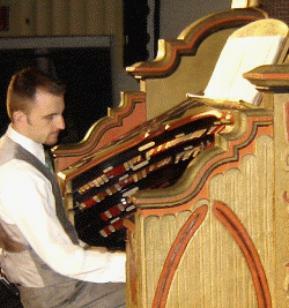 George Orbits then recounted the story of his acquisition of the organ from the Fisher Theater and its subsequent journey to the present dedicated home in the Senate Theater. 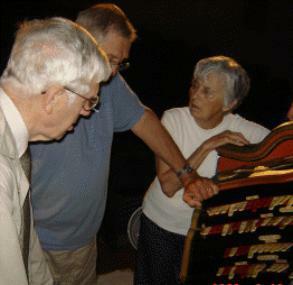 Stephen Warner also provided a PowerPoint presentation about the organ, originally prepared for a visit by the local chapters of the American Guild of Organists. 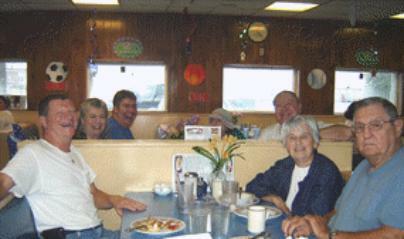 Following the extended open console, members of the group enjoyed lunch at George's Coney Island restaurant across from the Senate Theater (from left, John Keeber, MaryAnn Balduf, Trevor Dodd, Emily Seward, Carl Balduf, Dana Hull and Jerell Frederick. Reuben Seward leads the charge through the pipe chambers..